For both men and women, warrior or fighter tattoos are becoming increasingly popular: these images are able to portray inner strength, link to an individual's heritage, and provide a constant reminder of one's goals and aspirations. These tattoos can also demonstrate an individual's willingness to fight for the causes they believe in, to protect their family, and that they go into battle without fear. The myriad different design possibilities also make warrior tattoos an incredibly personal and custom tattoo to get. Check out some of the many different designs and meanings below! 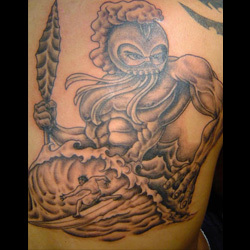 There are a variety of warrior tattoos that an individual can get, which means that your warrior design can be completely unique to you. If you know that you want a warrior or fighter tattoo but aren't sure which style to go with, discuss your ideas with your tattoo artist and get a few different designs mocked up. Consider adding weapons or other elements, such as enemies or scenery, in order to further personalize your design. 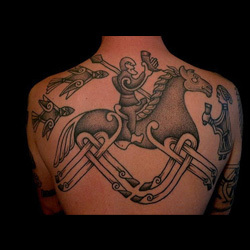 Celtic warrior tattoos are popular with people of Irish, Scottish, or Welsh descent, as well as with lovers of mythology and ancient warrior lore. This tattoo design will often feature the intricate knot details that Celtic art is known for, perhaps on its shield or helmet, or as a backdrop for the warrior to stand against. Celtic warriors are often depicted as almost Viking-like in stature and style, with long hair and beards that demonstrate their virility and power. Another option for your Celtic warrior tattoo design is to go with a simple sword design, but embellish it with Celtic knots along the hilt or blade. In terms of color, many of these designs are done in grayscale, but adding color will help to personalize your design: for instance, giving the warrior your hair/eye color or certain facial features will make it clear that you see yourself as the warrior, willing to go up against anyone or anything that stands in your way! 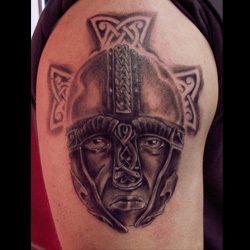 While the Celtic warrior tattoo may be perfect for some people, others may want to specify their heritage as being distinctly Irish. One way to do this is to make your warrior in the style of a particular Irish warrior, such as Cuchulainn or Maeve, or to add traditional Irish symbolism alongside your warrior, such as a harp, wolfhound, or shamrock. These additional elements can also be done in the Celtic style of design, using intricate and interweaving knots, and colors such as green and gold can be added to reflect the colors of the Irish flag. Others may want to link their Celtic warrior tattoo with their Scottish heritage, which is another great way to personalize a warrior tattoo. By representing traditional Scottish symbols, such as the thistle, St. Andrew's cross, or a particular tartan, within the tattoo, your design will be clearly linked to Scotland and its distinct history and culture. You can also have your Scottish warrior done in a likeness of legendary Scottish warriors such as William Wallace, Robert the Bruce, or Highland warriors. While greyscale is often the norm for many of the more intricate designs, adding colors can ensure that your Scottish warrior tattoo is unique and reflective of the hair, eye, and/or tartan color of the warrior you wish to depict. Tribal designs are a perennial tattoo favorite, but having a tribal warrior tattoo can set your design apart from the masses. By using the traditional style of tribal tattoos - broad black strokes that make up a design or image - you can create a warrior or a warrior symbol such as a shield or sword. This tribal style can be used to create a variety of warrior designs: for instance, you can create a Samoan warrior, Native American warrior totem, or Incan warrior using tribal design aesthetics, further connecting your warrior tattoo to your personality and heritage. Why should men have all the fun? Some of history's most famous and revered warriors, such as Joan of Arc and the Celtic warrior Maeve, have been women. These female warriors make an excellent choice for a tattoo, whether you're a man or woman. Having such a strong, powerful woman tattooed on your body can demonstrate your respect for feminine strength, be a symbol of your own feminist beliefs, or be a homage to a strong woman in your life. 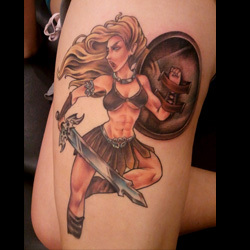 You can also design your own female warrior image for your tattoo, and depending on the tradition that your chosen female warrior comes from, such as Celtic, Zulu, Trojan, etc., you can have that design replicate the traditional artwork of that culture in order to connect the tattoo to your own heritage. Some of the most powerful and frightening warriors lived millennia ago, and fought in battles using only the sparsest of weaponry and armor. These formidable warriors were part of such diverse cultures as Greek, Viking, and Mongolian, and a great way to pay tribute to such ancient warriors is through a tattoo. To make your tattooed warrior particularly menacing, have the eyes done in a stark white with no pupils: this will give the impression that he can stare into the soul of anyone who crosses his path. 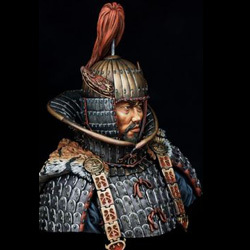 Adding a helmet or bloodied sword is another great touch, and dressing your ancient warrior in the tradition of the culture he's from will further personalize the design. One type of specific ancient warrior you may want to feature in your tattoo design is the Germanic warrior. These tattoos come from an ancient tradition which dates to the time of the Goths and other pagan tribes in Europe, and they can feature particular warrior gods, such as Odin, Thor, or Mjolnir, or certain symbols associated with these gods, such as Odin's raven or Thor's hammer, or runic inscriptions. The possibilities are truly endless! If you are choosing to depict an individual warrior in your tattoo, you can choose a realistic design, accurately reflecting the god's features and facial details, or a more symbolic design, in which the god can appear as a carved statue or on a shield. Greyscale is a good choice for these tattoos, as too much color can make particularly intricate designs seem too busy and confusing. Roman warriors are some of the most famed in history, notable for their role in ancient wars and battles as well as their strength and bravery as gladiators. One particularly distinctive detail you should include in order to ensure that your warrior tattoo is recognizable as a Roman one is the helmet: this can be done in either a steel grey or bronze color, and should have a red (or greyscale if you are working through that medium) top that almost resembles broom bristles or a plume in its shape. If you want to further personalize your tattoo, consider getting a phrase in Latin (the language of the ancient Romans) written underneath the warrior, such as 'carpe diem' (seize the day) or 'veni, vidi, vici' (I came, I saw, I conquered). The shield of your Roman warrior can also be personalized to include a striking design or depict an animal you share an affinity with. The culture and people of Hawaii are truly unique in America, and getting a Hawaiian warrior tattoo is an excellent way to demonstrate your state pride, as well as demonstrate the strength and beauty of your culture. The Hawaiian warrior is often depicted as masked warriors (as opposed to those wearing helmets), which could be used to intimidate enemies. You could also create a warrior armband using a black cross-hatching pattern: this can go either around your arm, or continue from your arm onto the left side of your chest, so to be positioned over your heart. To keep your tattoo in the traditional Hawaiian style, only use black ink. 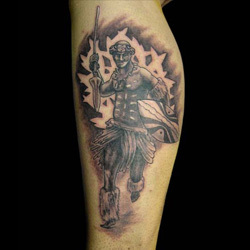 Getting a tattoo of a Filipino warrior can demonstrate the strength of tradition and deep ties to your culture. Symbolizing pride and bravery, these tattoos can depict individual warriors or symbols of warrior culture. For instance, one design idea would be to create an intricate scene with a muscled and traditionally-clad Filipino warrior poised and ready to strike with his spear or dagger, surrounded by the natural landscape and wildlife of the Philippines that he is bound to protect. This kind of design can utilize a range of colors to reflect the vibrancy of the culture and environment of the Philippines, though you can also work in greyscale if you prefer. Samurai tattoos are a great way to represent an ancient warrior art and culture that many still revere today. 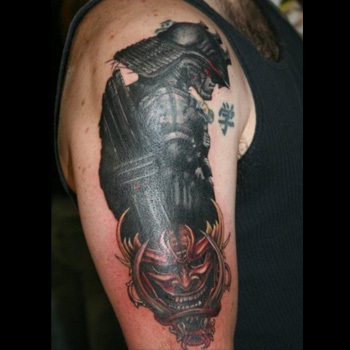 Whether you're Japanese by heritage or simply admire Japanese history and culture, getting a samurai tattoo is a great way to demonstrate your affinity with this ancient warrior class. Samurai tattoo designs often depict the warriors with their swords drawn and at the ready, often with fresh blood on them to represent the enemies they have already defeated. 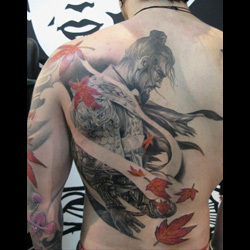 To personalize your tattoo design, consult your tattoo artist about how to depict a particular facial expression or dress style: you may want your samurai looking fierce with intense eyes and hair that has come loose during the course of battle, or you may choose instead to have him poised and relaxed, his hair still in a slick topknot. Greyscale is often used in samurai designs, but choosing to include color (such as red blood on the sword or a particularly stylized outfit) can further personalize your design. Getting a Christian warrior tattoo is a great way to demonstrate your faith and your willingness to stand up for what you believe in. One choice for this design would be to depict the Crusaders of the Middle Ages period - soldiers which fought for and brought glory to the Christian faith. Often these Crusaders are paired with banners depicting a red cross on a white background, or with this image on the front of their armor - make sure to include it if you are getting this warrior tattoo design! Another option for a Christian warrior tattoo is to depict a soldier - of any time - kneeling with his sword before a cross. 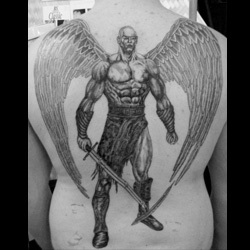 The soldier can also have wings, especially if the tattoo is in memory of a loved one in the armed forces who has passed away, and you can include the dates of your (or a loved one's) service underneath to further personalize the image. 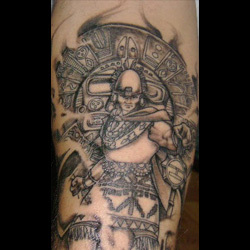 Many Inca warrior tattoos feature only the face of the warrior, making this a unique tattoo design as compared to other cultures in which the entire body of the warrior or a complete scene is depicted. This symbol features the face of a warrior, often with teeth bared and intense, white eyes, looking straight through the soul of its enemy. The stony face can be depicted on a shield, or can be against a backdrop of other Incan designs, such as a temple interior, or with certain spirit animals, like the jaguar. Many of these tattoos are done in greyscale, but adding elements of red or other colors can make this a more personalized design. Another famed ancient warrior is the Trojan warrior, perhaps best known for their part in the Trojan War. 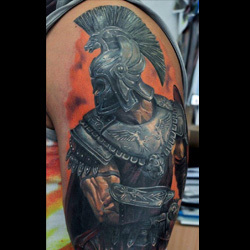 These soldiers from the ancient city of Troy have been the subjects of art, literature, music, and poetry for thousands of years, and getting a tattoo depicting or symbolizing a Trojan warrior can demonstrate your affinity with such culture and history. Though some Trojan warriors are depicted in a similar style to Roman warriors, with a bronze helmet topped with a red plume, one way to distinguish your design would be to get it in the style of ancient Greek ceramics. 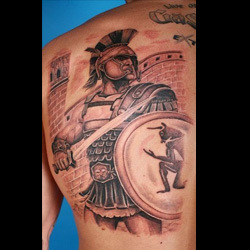 The pottery and earthenware of the Greeks would often feature heroes and scenes from battles, so why shouldn't your tattoo be the same? This will give your design a unique flair and ensure that everyone knows what warriors you are depicting. 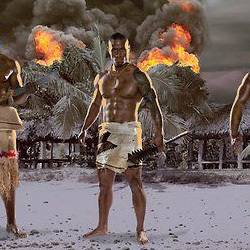 A Polynesian warrior is a strong symbol of your heritage and culture, as well as individual strength. Often, Polynesian warriors are depicted in tattoos through symbols such as spearheads, the preferred weapon of the warrior, or through battle masks. 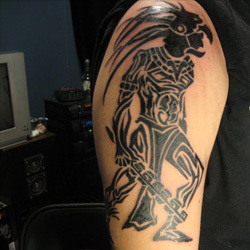 These designs are often done in a tribal tattoo style, with black being the ink color of choice, and geometric shapes account for much of the image. 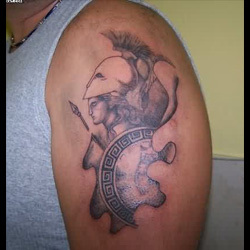 One design idea to personalize this tattoo is to get a series of spears done in armband pattern or around the wrist. These intricately patterned tattoos are unique in that they don't necessarily depict an actual warrior or a warrior's weapons - rather, they cover the upper arm and continue onto the chest, often on the left side to encompass the heart. These tattoos feature intricate patterns of geometric or symbolic (such as the Ankara) shapes, and are most commonly done in black ink. Feel free to inject color to add a more personal touch, perhaps used for a single shape or symbol in order to make that image stand out. The Cherokee tribe is one of the most recognizable and famous Native American tribes, partly because of their history as brave and wise warriors. There are several different options for designing your Cherokee warrior tattoo, making this a great choice for anyone who wants a particularly personalized design. 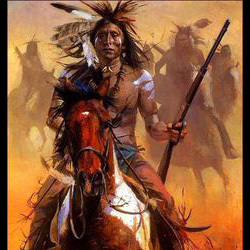 If you have Cherokee heritage, consider getting the image of one of your ancestors tattooed, but done in a stylized warrior pose: such as poised and ready to strike, atop a horse, or with their bow aimed and ready to fire. Unlike some warrior tattoos, using color is encouraged when getting a Cherokee warrior image, especially for the clothing and headdress details. 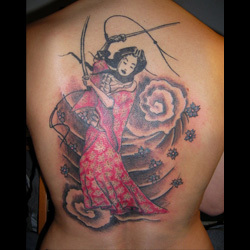 A geisha warrior tattoo is a unique spin on the warrior tattoo tradition, and is a perfect choice for any man or woman who wants a different, yet incredibly meaningful, warrior tattoo. Although the geisha's primary duties were to entertain and serve men, for many, the geisha is a symbol of intrigue, mystery, and power: her perceived subservience can easily fool others, making it all the more surprising when she attacks as a warrior. Many geisha warrior tattoos will balance this demureness with pure power, depicting a gentle and delicate woman who also has a bloodied sword drawn and at the ready. The geisha is often associated with the color red, so be sure to incorporate this into your design: using colors throughout the tattoo is also highly recommended, as this will allow you to capture the incredible details of their clothing, makeup, and accessories. Another excellent tattoo to consider is that of the Korean warrior: this is a perfect choice for anyone of Korean heritage, or who wants to depict an ancient and brave warrior on their body. These warriors are often depicted in full armor and ready to strike, such as with their sword drawn, sitting atop a powerful steed, or standing victorious on the battle ground. Though often done in greyscale, consider adding a few colorful elements to personalize your Korean warrior tattoo: a few flowers interspersed in your design lend it a softer touch, demonstrating the beauty, as well as power, of the warrior, while having the Korean flag in full color in the background can demonstrate your cultural pride. To further personalize your tattoo, consider getting something written in Korean script written underneath: maybe the name of an ancestor, or a particular word or phrase that is significant to you. Whether you are from Mexico, have Mexican heritage, or simply love and respect Mexican culture, getting a Mexican warrior tattoo is a great expression of this affinity for Mexico. Sometimes, these warriors are depicted as skulls or skeletons, in the 'day of the dead' artistic tradition, but they can also be full-bodied, living warriors. One unique design element of the Mexican warrior is the fighter's headdress: this is often taken from an animal, be it eagle or jaguar, with the top half of the teeth or beak covering the warrior's skull. This creates a ferocious image, and also allows for unique customization in your design: choose an animal that has a particular meaning for you and use this as the headdress! 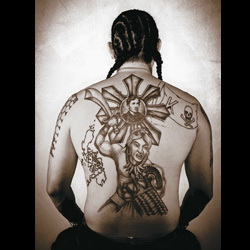 Color is often more widely used in Mexican warrior tattoos, allowing for additional personalization. The Zulu tribe is native to South Africa, and getting a Zulu warrior tattoo - whether it depicts an actual warrior or the symbolism associated with warriors - is a powerful expression of your own personality, heritage, or cultural affinity. Traditionally, Zulu warriors would be almost covered in tattoos of intricately detailed and multi-colored tribal designs, usually along the back or chest and ribs, which featured the warrior's shield or spear: this symbolized how they were always ready for battle, and that bravery was a part of their everyday life. 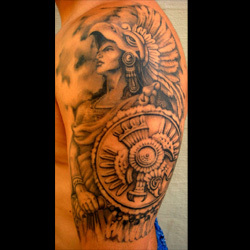 If this is too large of a tattoo for your liking, consider getting a smaller image of a warrior himself done on your arm or across a shoulder blade: the warrior should have their spear and shield in hand so that the spirit of battle-readiness is clearly conveyed. 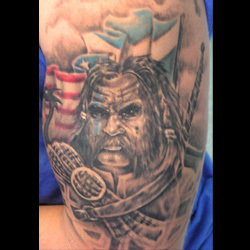 There are so many varieties of warrior tattoos, ranging from ancient tribesmen to memorials for fallen comrades in arms. These tattoos are great for both men and women, and the rich history of cultures from around the globe means that you can find the perfect, personal tattoo that's just right for you! 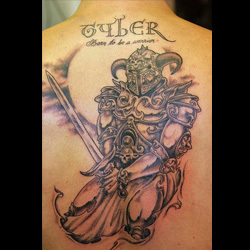 For custom design of a Warrior, you can check our Custom Tattoo Page.